It’s November! That means Thanksgiving and Christmas are right around the corner. We all get so busy this time of year I thought I’d do the research for you. I asked some of my favorite recipe bloggers to share their favorite holiday recipes with you. 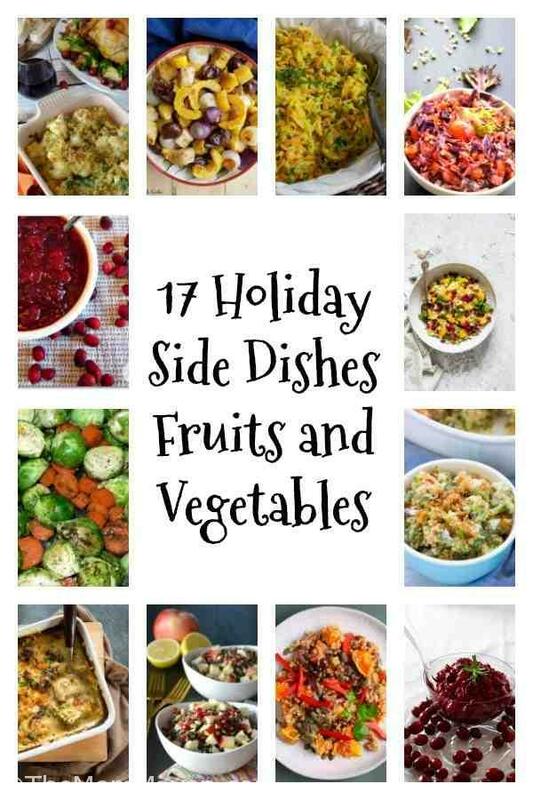 Today I have 17 Holiday side dished-fruits and vegetables and next week I’ll have 15 holiday side dishes stuffings and potatoes. That will give you 32 new recipes to choose from you as you plan your holiday dinner menus. Let’s start with a staple at many holiday dinner tables, Green Bean Casserole (with a secret ingredient) from Down Red Bud Drive. Tasty Galaxy shared these Roasted Brussel Sprouts and Carrots. This Broccoli and Cauliflower Cheese Bake from Don’t Go Bacon My Heart sounds like something my husband would enjoy. Platter Talk shared a traditional Scalloped Corn Casserole. My mom would love this Harvest Squash Casserole from What a Girl Eats. Here is a Broccoli Casserole from Kristine’s Kitchen. These Maple Glazed Roasted Fall Vegetables from Cooking with Carlee sound like something we would have had at Thanksgiving back in New England. My Slow Cooker Herbed Creamed Corn from right here on The Mom Maven is a simple side dish to take with you if someone else is hosting dinner. My Midlife Kitchen shares her twist on a classic-Garlic Alfredo Green Bean Casserole. Platter Talk also shared their Cauliflower Gratin. If you are looking for a more unique side dish try this Vegetable and Green Gram Sprouts Salad from Flavours Treat. 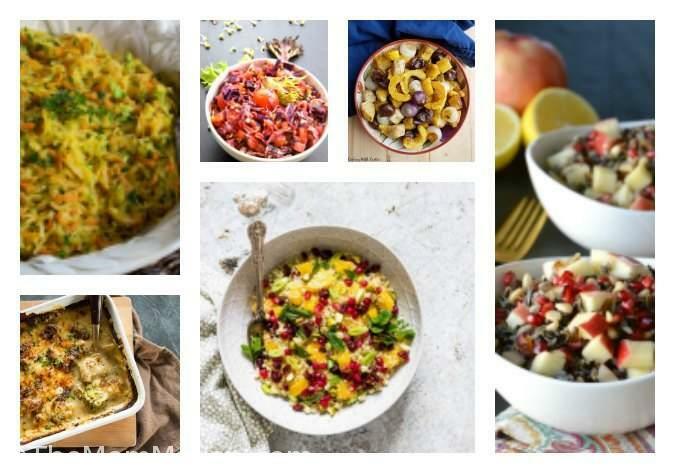 You might like this unique salad from Recipes From a Pantry, it’s an Orange, Pistachio, and Pomegranate Couscous Salad. This Wild Rice with Apple and Pomegranate Salad from Veggies Save the Day might be just what you were looking for. I didn’t know if I should put this one under salads or under fruit dishes so…here it is: From Rhian’s Recipes comes her Pumpkin, Cranberry, Quinoa Salad. I am a cranberry sauce right out of the can kind of girl, yes, it isn’t Thanksgiving or Christmas if the cranberry sauce isn’t shaped like a can 🙂 It seems other people like whole berry cranberries <gasp> so here are 3 cranberry (fruit) dishes for you to try. Older Mommy Still Yummy shared her Cranberry Sauce 2 Ways recipe. Raia’s Recipes shares her Cider and Elderberry Cranberry Sauce. Last but not least we have the delicious sounding Pineapple Orange Cranberry Sauce from Delicious Table. I will have to make a couple of new vegetables this year, cause they look and sound so yummy. Yay for Thanksgiving! Love all these side dishes. Pinned and tweeted!